Before this meeting, this request was posted on Nextdoor by the FNC member coordinating the panel: “Fremont Neighborhood Council (FNC) is seeking information from Neighborhood Residents on Mail and Package Theft. 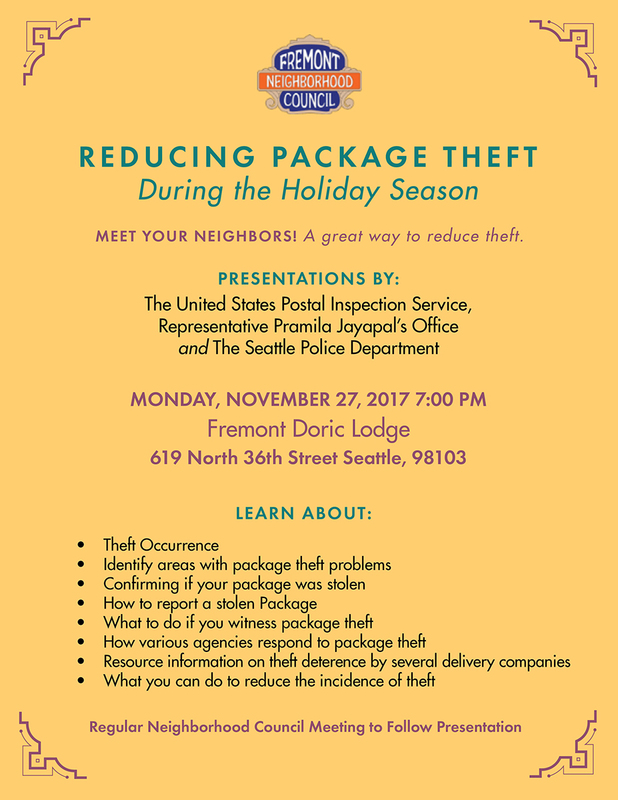 An Inspector from the United States Postal Service and a Crime Prevention Coordinator from the Seattle Police Department will be attending the November Meeting of the Fremont Neighborhood Council ( November 27th at 7 PM, Doric Lodge, 619 N. 36th Street) and we are interested in providing data to them at the meeting. I am a neighborhood resident and I am working on this event. If you have been a victim of mail or package theft in the last three years and would be willing to Direct Message (DM) me with the block, date, and delivery service (USPO, UPS) I would like to compile it prior to the meeting. Thanks for your assistance. We are especially interested in chronic locations; the information will be helpful in our discussion of the issue.” If you are on Nextdoor, from Fremont or nearby neighborhoods, you should be able to respond there.